very tasty rice -can be prepared quickly. Grind together mint leaves- 1 bunch, ginger - 1 inch size,green chillies - 3 nos and fennel seeds-1 tsp to a smooth paste. Heat oil and ghee in a pan and saute cinnamon stick - 1 no(crushed),green cardamom - 2 no.s(crushed) and cloves - 2 no.s(crushed) for a min. Add the ginger-mint paste and chopped onions and saute for 2-3 mins only. Add the chopped spring onions and chopped capsicum and saute for a min. Then add the cooked basmati rice and mix well for a min.then turn off the flame. 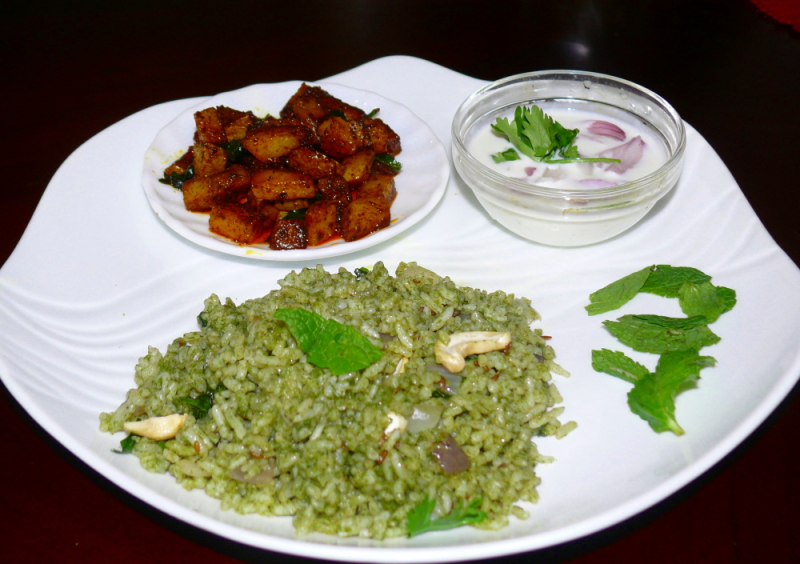 Serve the mint rice hot with raita of your choice. Hi hfshama!.Thanks a lot for giving ur feedback.U can try this Mint Rice with cumin seeds instead of fennel seeds(if u don't like the fennel flavour).U can try this rice without pasting the mint leaves(paste ginger,g.chillies and cumin or fennel seeds)-in this case add the soaked basmati rice and 2 1/2 cups water and pressure cook rice with spices along(not doing it separately and adding). very tasty christy. 1 more easy and quick type of rice to pack for lunch! Hi Sadiya!,Thank u so much.Note: Add 1 tsp ginger-garlic paste and the ground ginger-mint paste in step 3 after sauting the chopped onions-to make it taste better. Hi Mariya, thank you so much for trying the Mint rice .It is very esy to do also. Please note that the chopped Mint leaves should not exceed 2 to 2 1/2 cups. (you can add 1/2 tsp lime juice to the masala before adding the chopped spring onions and chopped capsicum but it is optional) You can fry 12 no.s of cashews(cut into pieces) first in the ghee-oil, before starting the dish and keep it aside. Add it to the done-Mint rice with 1tsp chopped mint leaves on top.